Before we get to what modern Stoics have allegedly stripped out, let me address what Vernon has said so far, beginning with the idea that (ancient) Stoicism was challenging. Of course. All philosophies of life, or religions (which come with a built-in philosophy of life) are challenging, if one means to practice them seriously. If you think being a Christian or a Buddhist isn’t challenging you have not understood what Christianity or Buddhism are about. And that’s true for the ancient as well as the modern versions of all these approaches to life. I don’t know many modern Stoics who don’t think that to be the case, and indeed lots of discussions at the large Stoicism Facebook community (almost 24,000 at current counting) focus precisely on the challenges of practice, the community being, in a sense, a large mutual support group. Vernon then says that Epictetus’ dichotomy of control has been reduced to today’s “virtue à la mode,” as he calls resilience. I’m not sure where he is getting that, but it is nowhere to be found in any of the modern books on Stoicism I’ve read thus far, including Don Robertson’s, Bill Irvine’s, Larry Becker’s, or my own. But it appears from his sneering at “corporate” Stoicism that Vernon’s real targets are the likes of Ryan Holiday and Tim Ferris. I have written about what I think of that approach before, but even in those books I see little to substantiate Vernon’s attitude. Sure, they are more self-help than philosophy, addressed to a particular audience, and written in a style that is alien to my own way of writing. But so what? If they are helpful to people, that’s a good thing. And who knows how many that would have never heard of Stoicism before have taken or will take a look at the ancient authors as a result of reading Holiday or Ferris. That’s a good thing too. Ah, yes, the old “gods not atoms” objection. Except that even the ancient Stoics were pretty clear that their metaphysics underdetermines — as modern philosophers would put it — their ethics, meaning that their ethical practice is compatible with more than one (but not just any) metaphysical stance. It is hard to read any of the above and not agree that for the Stoics it simply did not matter whether the universe is arranged by a benevolent Providence or not. One still has to do one’s best to contribute to the polis of humanity. But the Logos was nothing like that. The Stoics were pantheists, so their “god” was immanent in the universe, and made of matter. Indeed god simply is the universe for the Stoics, and accordingly they used words like “god,” “nature,” and “cosmos” interchangeably. The “divine” is everywhere, and we are literally bits and pieces of it. There is nothing at all in this conception that hints at omnipresence, if not in the trivial sense that the universe is everywhere (where else would it be? ), and even less so omnipotence. The “irresistibility” of the Stoic god is the irresistibility of the universal web of cause and effect, as explained by Chrysippus. Ah, you’ve got to love it when a former priest approvingly mentions Nietzsche, the uber-bad boy of philosophy! At some point I will write a separate post on Nietzsche and the Stoics, apparently it’s sorely needed. None of that may have meant anything to Nietzsche himself, but when Nietzsche says that the point is precisely to be otherwise than nature, he seems to impute to the Stoics a type of appeal to nature, a logically fallacious argument (X is natural, therefore X is good) that would have taken Chrysippus a nanosecond to dispatch of. Yes, that is one of the most Christian-sounding sound bites from Marcus, though there is a lot of room for a more neutral interpretation there too. But what about this, also from the emperor-philosopher? That’s a pretty bleak take not just on modern Stoicism, but on the human spirit. There is no question that if one believes in a benign Providence and in a grand plan orchestrated by a benevolent God then life is easier to bear. But it is highly doubtful that even the ancient Stoics accepted anything like that view of the cosmos, and it is certain that they didn’t think it was required in order to “live according to nature,” i.e., to be decent people who do their best in order to make existence a little bit better for everyone. And to impute either shallowness or willful ignorance to modern Stoics if they don’t accept Vernon’s particular theology is downright insulting. Except that Stoics, ancient and modern, don’t believe in insults. But neither Nietzsche nor Vernon are in a position to understand why. This entry was posted in Critics of Stoicism on June 27, 2017 by Massimo. I guess he should have taken his own advice and read the first line of the Enchiridion. I think Vernon’s point is, or should have been, that the ancient Stoics practised piety as did Cleanthes in his hymn. Showing a reverential awe and gratitude toward the universe was part of being a good person and comes through in Epictetus. It is less a matter of belief than attitude. A modern example might be Jodi Foster in the movie “Contact” where on her trip through the wormhole exclaims “Beautiful”. She didn’t change her belief as a scientist but her attitude was transformed by her experience. Right, but that attitude of awe toward the cosmos is definitely practiced by secular people, including myself. That’s why one of my favorite meditations is the sunrise one inspired by Meditations XI.27. Massimo, thanks for this clear-eyed post. In addition to the post about Nietzsche, I would find very valuable one which contrasts your views on Stoicism with the natural law thinking that today dominates in many intellectual conservative circles: among jurists (Robert P. George, John Finnis, Hadley Arkes, for instance), (neo-)Thomist Catholics, Straussians, certain right-wing think tanks (Witherspoon, James Wilson Institute, Acton, etc. ), and in various journals (First Things, Lex Naturalis, etc.). Under the radar, this approach has become a strong force on the right in recent decades, including in the Academy. This medieval/neo-Aristotelian natural law takes a hard-line stance on what constitutes “nature” and thus human flourishing. It seems clear that your (better) understanding of ancient views of nature does not accord with this conservative version, which, incidentally, strongly favors Aristotle and Cicero over the Stoics. Thanks for this. I don’t see any fundamental incompatibility between Epictetus’s view of giving up desires (which I think is a more elaborate relative of the popular wisdom known as “picking one’s battles”) and a non-theistic view of nature, as long as nature is not viewed too narrowly, as it seems to be in this former priest’s article as the classic “struggle for survival.” I don’t think nature has to be seen as transcendent or benevolent in order for one to be able to accept the lot that nature assigns him or her; they just have to see it as being “no evil” as the ancients put it, and appreciate that the same natural law that mandates that we all die either by getting sick in old age, violence, accidents, the destruction of the Solar System, or the changes of state of the Universe is also what allows us to exist and contemplate in the first place. As a scientist, I don’t see nature as alive, but I do see it as dynamic, and life is just a kind of peculiar, complicated case of dynamics. So the loss or absence of life is not a loss or absence of order or of anything essential to the cosmos. Therefore, I don’t think not being a theist – not seeing the universe as necessarily having characteristics that can only be described in mental life terms and not in physical or mechanistic terms – is a guaranteed impediment to the less glamorous side of Stoicism, which is accepting the things you can’t control and that the outcomes of your actions are among those things. Just as (perhaps) Vernon gets modern Stoicism wrong, I think you get Nietzsche wrong, at least to some extent. For example: “None of that may have meant anything to Nietzsche himself, who — let’s not forget — had a pretty horrible record of human interactions throughout his life. But that’s a point scored against nihilism, not Stoicism.” Which horrible human interactions are you referring to? Nietzsche had several close friends and was by all accounts unfailingly polite and courteous, if a bit stiff and formal, in his personal interactions with everyone. The Paul Ree/ Lou Salome break was bad, but hardly horrible or an example of his usual behavior. Also, to consider Nietzsche’s philosophy nihilist (rather than, for example, aiming at overcoming the nihilism he saw around him) is far from a universal view. 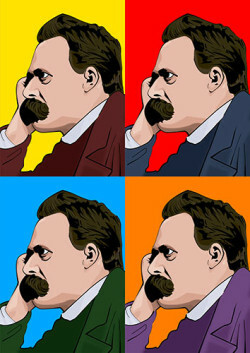 If you do write a post on Nietzsche and Stoicism, you might consider reading the following to get a broader picture of Nietzsche (that you might still hate): Julian Young’s recent biography Friedrich Nietzsche, Brian Leiter’s Nietzsche on Morality, Alexander Nehamas’ Nietzsche: Life as Literature, and Robert Solomon’s Living with Nietzsche. Solomon’s book does a plausible job of interpreting Nietzsche as a virtue ethicist of a sort, which would put him closer to the Stoics than other modern ethical traditions. Fair points, I have edited that bit of the OP. And thanks for the reference, I’ll look it up. Wayne: Definitely will check out the Solomon book that makes a case for Nietzsche as a virtue ethicist. How do you view the argument, does he make a good case? A brief intro is here: http://tinyurl.com/pzqttvt and in the linked paper. See also this discussion http://tinyurl.com/ydbefqe2 and the pertinent chapter of Irvine’s book. More in-depth treatments from the ancient sources are in Diogenes Laertius (the book on the Stoics) and Cicero (De Finibus, book III). Jaycel, I think Solomon does make a good case. He draws out the explicit and implicit virtues that Nietzsche celebrates in his work, and outlines one of the joyful, affirmative versions of Nietzsche that many don’t seem to see. Tim Ferriss is the reason I learned of Stoicism as something worth looking into. Bought On the Shortness of Life and it changed everything. Found I already had a copy of Meditations and went from there. Wayne: Terrific. Just ordered it on Amazon. Thanks again for the recommendation.